Pine Creek Rail Trail. Mile by Mile Guide. 62 miles of Pure Enjoyment! 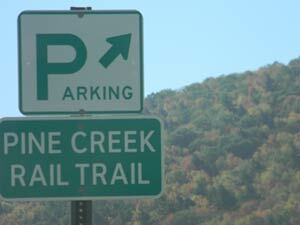 ...Families, Friends and Couples will all enjoy The Pine Creek Rail Trail, one of Pennsylvania’s most scenic treasures. The gradual grade is barely detectable and makes for an enjoyable bike ride, walk, or ski, and in portions, horseback ride. 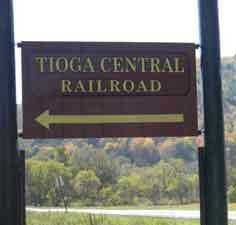 From its southern terminus in Jersey Shore Pennsylvania, the Pine Creek Rail Trail travels through Lycoming County north into Tioga County. From the editor: I have covered the mile-by-mile tour of the Pine Creek Rail Trail and I sincerely hope that this article helps you on your way to a great adventure. I have enjoyed rides departing from each of the access areas along Pine Creek and I recommend them all! ...A scenic wonderland filled with cliff walls and water falls, and a gorgeous waterway with a terrific trailside terrace that travels through miles and miles of majestic natural beauty; trees and mountains, deer and bear and fresh air, otters and eagles, and an ancient canyon trail that awaits your arrival...the Pine Creek Rail Trail. Gear Tip: Bicycles with wide tires seem to do best on the Pine Creek Rail Trail, either Mountain Bikes or Multi-Speed Cruiser Bikes seem to be the popular choice. There is a packed fine gravel surface that at times may be too soft to support a narrow road type tire, so the wider type tire generally works better. Be certain to bring along your safety gear including a helmet, also a pump and a bicycle tire patch kit (or two). Bring your mountain bike OR just your walking shoes, and let the adventure begin. The extremely gradual grade makes for easy bicycling, or hiking. From north to south, the Pine Creek Rail Trail extends from the Wellsboro Pa area to the Jersey Shore Pa area. To locate the northern head of the trail, travel north from Wellsboro on rt.287 to Wellsboro Junction. 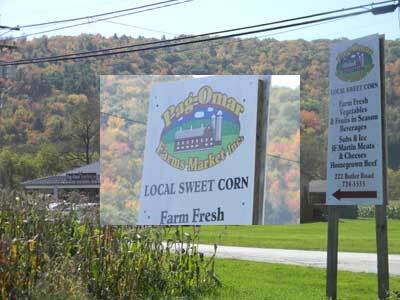 There you will see the Tioga Central Railroad and Pag Omar farm market. Turn left onto Marsh Creek road then a quick left and go past the farm market to a parking area at the head of the trail. From here the Pine Creek Rail Trail parallels rt. 6 for 7.7 miles to Ansonia then parallels rt. 362 for another 1.2 miles to the Darling Run access and parking area. 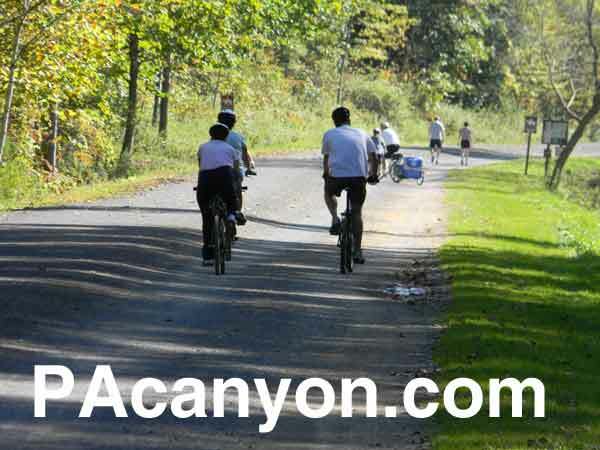 This is the northern access to the PA Grand Canyon and one of the most popular areas to start a bike ride or walk/run. Darling Run has a parking area, comfort facilities and posted information. There are no intersecting roads from Darling Run to Blackwell. This 16 mile section is the most secluded and pristine, this is the national natural landmark known as the Pine Creek gorge or the Pennsylvania Grand Canyon. The PA canyon offers vista views from Leonard Harrison State Park on the east rim (via rt. 660) and Colton Point State Park on the west rim (via rt.6/Forest road). These overlooks are visible from the Pine Creek Rail Trail at the slightly northern half of the canyon trail tour. Here you will pass the Turkey path, a hiking trail that winds its way to the top of the canyon, to the Leonard Harrison State park lookout area. There is a snack bar, information and bathrooms. Some facilities may only be available seasonally. Past the canyon overlooks, farther south on the Pine Creek Rail Trail you will arrive at Tiadaghton. This is 7.7miles from Darling Run. This is a very pleasant place to stop and have a picnic snack, and a look at the beauty. (I should add here that yes, there is a road into Tiadaghton, BUT it is BIG time hairy, YES, it is steeeeeeeep. And 4 wheel drive and really good brakes and tires and health insurance are highly recommended and travel at your own risk, etc. Guided tours may be available) There is a picnic area and toilet facilities. This is along Pine Creek where critters, including eagles and bears, like to visit. Awesome! The bicycle tour continues south 8.3 miles through more amazing wilderness along pine creek at the base of the canyon to Blackwell, accessible from car via routes 287 to 414. This is the southern access to the PA canyon. The Pine Creek Rail Trail continues south from Blackwell 1.8 miles to a nice parking area and a fantastic secret feature attraction, Rattlesnake rock. This is an area that is worth exploring. A little narrow foot path extends off of the trail towards pine creek and brings you to a beautiful large flat rock area that sits in the creek. Stop and take a moment to enjoy the compelling structure and surroundings. Another 2.7 miles south and you will find yourself at the quaint village of Cedar Run, a small settlement along pine creek, and plan ahead for fantastic fare at the cedar run inn. Continue 3.4 miles to Hilborn Fields and then 2.7 miles to Slate Run where there is a general store with supplies, yummy baked goods and fishing gear. The Pine Creek Rail Trail runs along route 414 through this section, 1.8 miles to Black Walnut Bottom, a nice pull off, park and picnic spot along the creek, then 2.7 miles to Ross Run and then 3.1 miles to the Cammal Comfort Station. As you continue south from Cammal, it is 5.4 miles to Dry Run and then another 2.3 miles to the Waterville Access Area. There you will find a couple restaurant/bars for your dining pleasures and entertainment. The southern leg of the Pine Creek Rail Trail travels along route 44. From Waterville it is 4.3 miles to Bonnell Flats and then a long 6.1 mile section to the Jersey Shore area, to the intersection of Rt 44 and 220. Most new travelers to the area will want to experience the section of the trail between Blackwell, Tiadaghton and Darling Run, but if you are making this a quick trip , from say Harrisburg, or Philly, etc., you may want to stay in Williamsport and start your adventure at the Jersey Shore access area, which is about ten minutes from Williamsport. For the bike riders among us, it has been my experience that the wind can be more of a factor than the actual grade of the Pine Creek Rail Trail. On a blustery day, you may at times experience the wind actually pushing your bike uphill against the grade, and visa versa, perhaps inhibiting a coast. It’s all part of the fun. Horseback Riders can park at the Ansonia access area. There is sufficient room for horse trailers to maneuver and park. From the Ansonia access area to Tiadaghton, horse riders can use the dirt road that travels along side of the rail trail. This is a beautiful ride through a sweet spot on the Northern part of the Pine Creek Rail Trail. There are several roads leading north into the PA canyon area. From Williamsport, off of I80 and 180, rt.15 north has exits for Mansfield (to Wellsboro) or Liberty (to Morris / Blackwell). From rt.220, at the Jersey Shore area, a more scenic drive is rt. 287 north to Morris and Wellsboro, or the most scenic drive, rt. 44 and 414, traveling along side of the southern portion of the Pine Creek Rail Trail.